mklink /J "%SITECORE%Website\sitecore modules\PowerShell" "%PROJECT%sitecore modules\PowerShell"
mklink /J "%SITECORE%Website\sitecore modules\Shell\PowerShell" "%PROJECT%sitecore modules\Shell\PowerShell"
Once you I have my folders set up I look into the repository and look what’s changed since the last release and do the manual “Revert tree” on the content branches that have changed since the last release. I Agree – this should be automated, but it happens so infrequently to me that I’ve not had much motivation to do that yet. 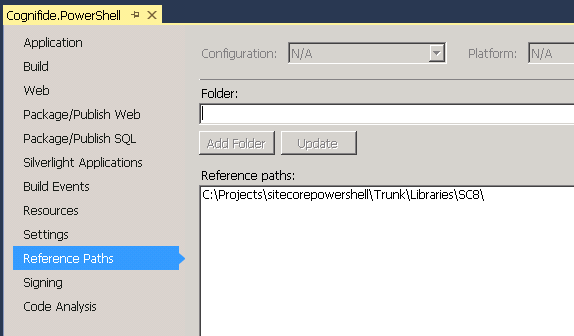 And depending on which version of Sitecore I’m working with I update the reference paths in Visual Studio to point to the relevant folder. You’re probably going to need only the latest version of SC7x and SC8 as the code might not compile with older versions. It will run, but might not compile due to lacks in the older versions of Sitecore APIs. The IF that checks the machine name is there only so that it doesn’t cause problems for other contributors as I only want this to happen on my machine. You might add a line for your machine if you want this happening automatically for you. Now you’re ready to start developing PowerShell Extensions. 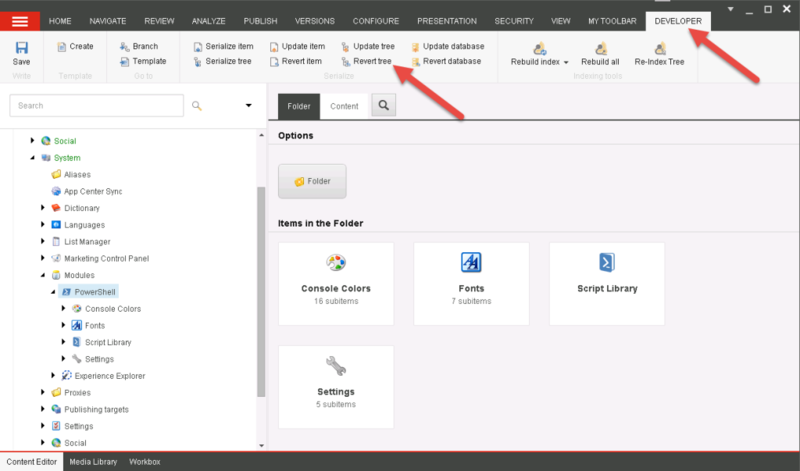 You can Build your solution and your Sitecore Instance should immediately pick up all tha changes. All you need to do to debug is attach to the relevant w3wp.exe process. running this script should serialize all your changes that are in the branches that we track. If you’ve added any items that would not be handled by this script (like a new integration point) you should modify this script to include those, and serialize it as well. In the case of modifying the above script you should also modify the Prepare Console Distribution script in the same Script Library so that such items will make it into the next release package. 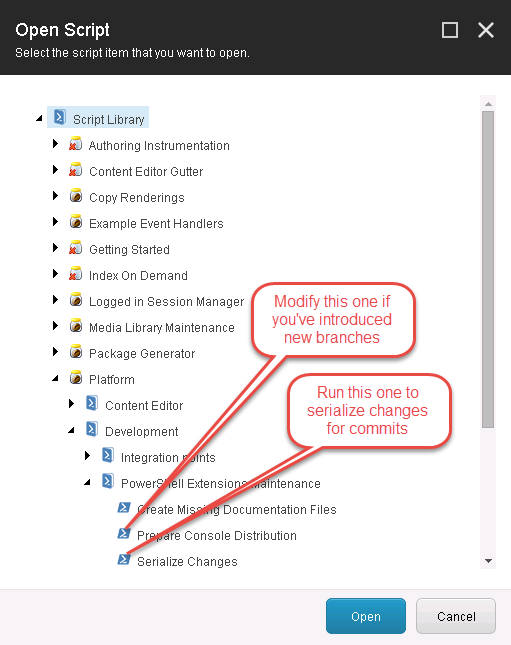 Please be mindful that there are 2 branches that are actively developed at this time – Sitecore 8 is on the master branch while Sitecore 7 development is happening in the sitecore7 branch. 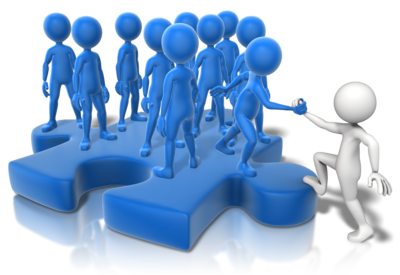 What I usually do is develop on one branch and cherry-pick commits after switching to the other one. This entry (Permalink) was posted on Tuesday, March 3rd, 2015 at 9:15 am	and is filed under .Net Framework, Best Practices, C#, Code Samples, Open Source, PowerShell, Sitecore, Software Development, Solution, Web applications. You can follow any responses to this entry through the RSS 2.0 feed. You can leave a response , or trackback from your own site.